Goldman Sachs has made some interesting observations about the relative sizes of U.S. companies compared to Europeans. Apple alone is the same size as the whole Spanish equity market and bigger than Italy. 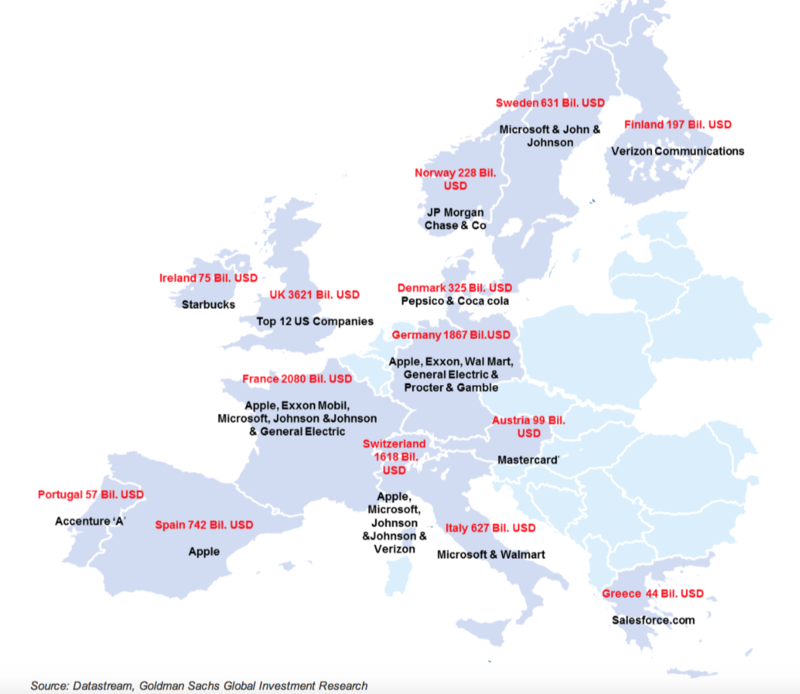 A US equity map of Europe – US companies shown in each country equate to the size of total market capitalization in the country Europe’s 600 biggest companies (the Stoxx600) are less than half the size of the S&P 500. It’s also interesting that even in the context of Europe the Swiss market alone is bigger than Spain and the Netherlands combined. The UK 100 biggest companies (FTSE 100) are bigger than the CAC and Dax put together. This entry was posted in Assets on July 15, 2015 by Phoenix Investor Relations.